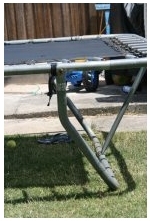 Topline Trampolines - How to know if you need an LK Brand Mat? Do you need LK Brand Mat? 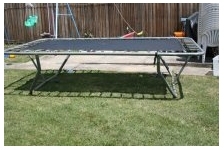 If the legs of your Trampoline are shaped like the trampoline below, then you need to order the LK Brand Mat! Also, check to see what type of mat attachments there are. If there are Wire Bars, INSIDE the Mat Hem, this is an Aussie made mat. We make our mats here in the Aussie way, using the wire bar system. We feel it is a better system. Just re-use your old wires and re-insert them into the new mat hem. However, if there is metal triangles sewn onto the edge of the Mat, this is Chinese made mat and you will need to also purchase a whole set of wires. All of these mats are – $85 (without wires)…Or these Mats with a whole Set of Wires – $99. Postage price approx $15. With all mats, you will need to get the mat hem restitched every few years to get a longer lifespan!